"People have to be led away from wanting what is traditional"
Guy Sydenham joined Poole Pottery in 1931, completing a 7 year apprenticeship working alongside James Radley Young, John Adams and Truda Carter. The War interrupted Guy's career. He returned to the Pottery after military service, initially training apprentices and setting up the production process as the factory modernised after the War. 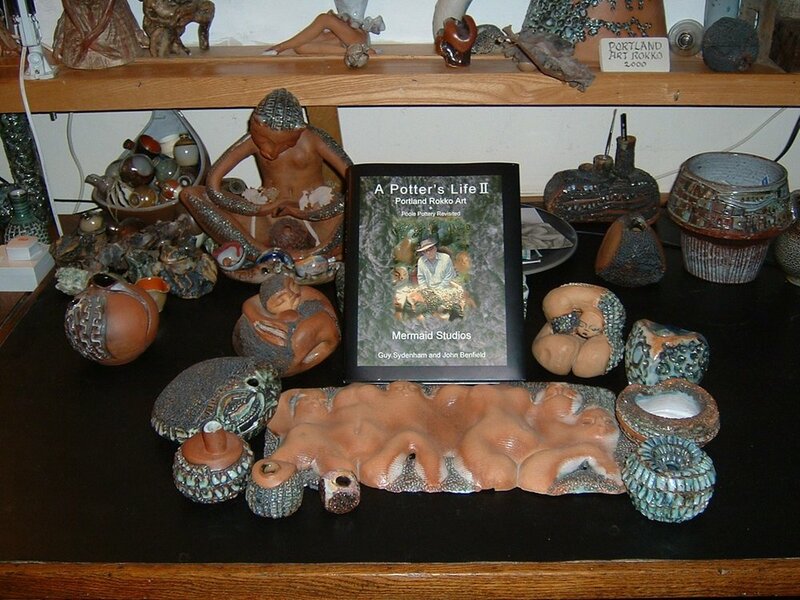 Guy's two volume autobiography ‘A Potter’s Life’ and ‘A Potter’s Life II’ are fascinating reading. Copies of the first volume turn up on ebay from time to time. The second volume is still in print. Two of Guy's earliest pieces made in the early 1930's at Poole College of Art. Above - plate thrown and decorated by Guy Sydenham showing M.V.Oklahoma on Green Island, 1970. From 1950 until 1955 Guy and his wife Joan lived on a mooring in Poole Harbour on MV Oklahoma, a 72 foot converted naval motor torpedo boat (formerly M.T.B.453). In 1955, following an addition to the family (Russell Sydenham) Guy negotiated a lease of Long Island, where Oklahoma was berthed. Long Island had a seam of Dorset blue clay, washed out of a cliff by the waves. With very little money and using driftwood and discarded materials from Poole Pottery, Guy built a studio. A pottery wheel was made from scrap and a trench was cut into a clay bank to make Guy's first kiln, fired by driftwood (this was later replaced by a paraffin-fired kiln using parts salvaged from the Poole Pottery scrapyard). From 1960 until 1987 Guy produced pottery, first on Long Island and then on Green Island, at the same time working full time as head of the 'making department' at Poole Pottery (until his resignation in 1977). 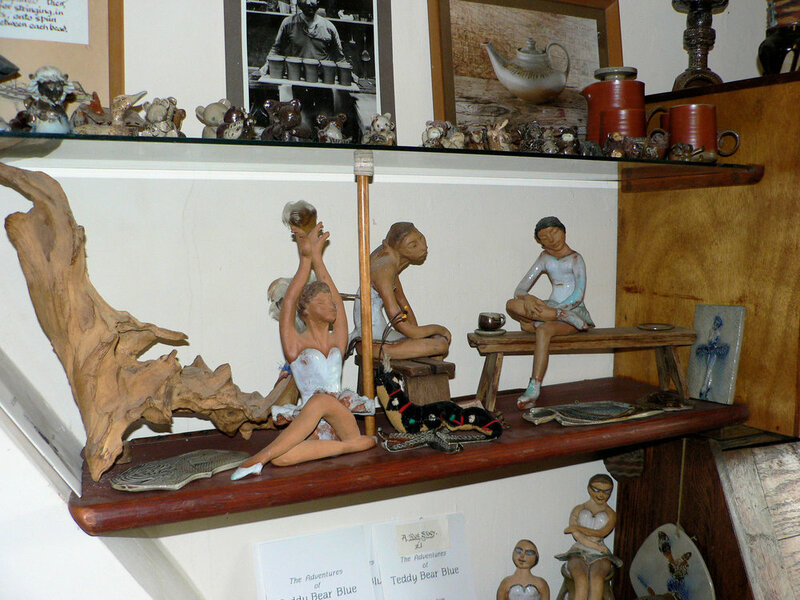 The pottery was sold at local craft shops and galleries. Throughout the 1960's Guy also lectured at Poole College of Art. Above - salt glazing; the effect achieved by the slow introduction of sea water to the kiln when the pots are yellow/white hot; Green Island 1977-87. Salt glazing is believed to have had its origins in 16th Century Germany. The best known early examples are jugs and mugs bearing the caricatured face of Cardinal Bellarmine which were produced to hold wine and beer. Guy was commissioned to make reproductions of the German originals by an American collector. Most of Guy's pottery is clearly marked and it is very rare to find an unmarked piece. The earliest Long Island mark is a pair of mallards' feet, made from a copper nail head filed to shape and impressed in the soft clay. The same mark also appears on later pieces, accompanied by other marks. All of the Sydenham family marks and their respective dates are set out in 'A Potter's Life' and 'A Potter's Life II'. The list shown below may be helpful in identifying some of the marks. These do not always appear on the base of the pot, sometimes you have to look for them. The Green Island mark (top right) is in the shape of Green Island. The Quay Pottery mark (bottom left) is a pun on the word 'key'. The mark on the lower far right is not listed below but is recorded as a transitional mark between Green Island and Portland in A Potter's Life II. Guy describes the early 1960's as a time when ‘exciting things were coming off the kilns’. Pieces were spontaneous and innovative, frequently taking their inspiration from the marine environment. At low tide in Poole Harbour old salt glazed drainage pipes are plentiful. It was the wholly fortuitous variety of textures and colours in these salt-glazed pipes which first inspired Guy to experiment with salt glazing ['Salt Glazing on Green Island', Real Pottery, reproduced in 'A Potter's Life']. Above - Poole Harbour flotsam from a shelf in Guy's studio. The barnacles are reproduced on the 'pipe vases' below. The shape has much in common with the later Poole Atlantis lamps. 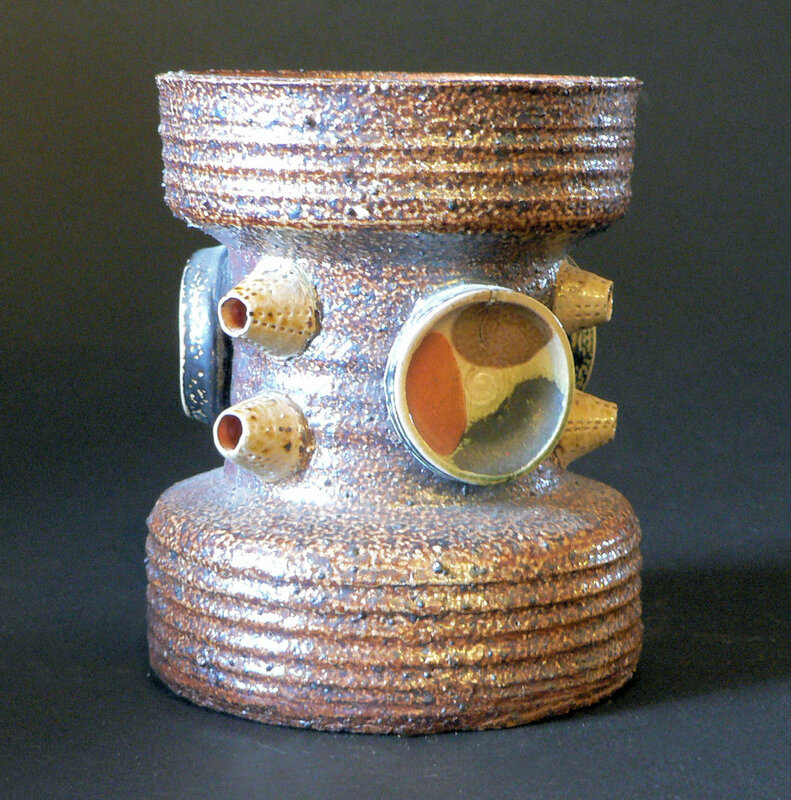 Above - inspired by salt-glazed drainage pipes - vases with barnacles and assorted other molluscs, Long Island early 1960's. These vases are undoubtedly the forerunners of the so-called 'monkey vases' Guy produced at Poole Pottery in the 1960's and 70's. Above - Salt-glazed pipe vase with molluscs and a cobalt glaze, Green Island. The Sydenhams upped anchor from Long Island in 1968 and moved two miles east to Green Island. The mark at the foot of the pot (see above) is an outline of the island. Above - potter's kick-wheel made by Guy and bearing his monogram, 1984. Green Island also had a seam of Dorset blue clay. Left - Wakeham barnacles in high fired terracotta. 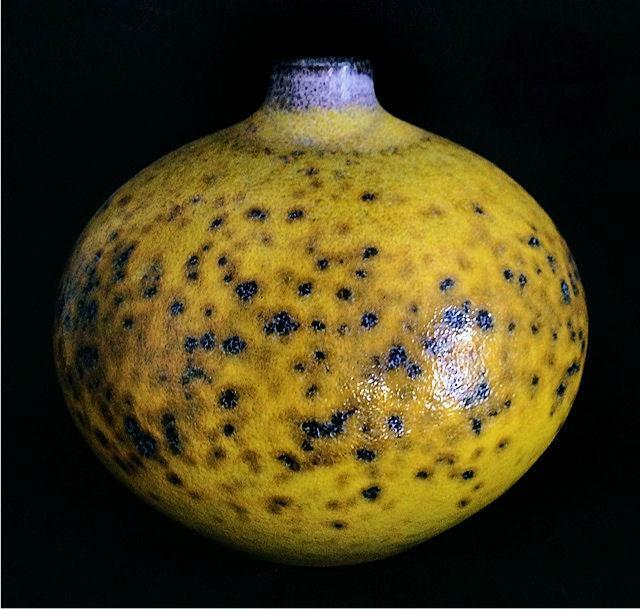 Right - salt pig with barnacles, Long Island, early 1960's. Above - salt-glazed pigs (two different ones). Pipe vases with more stylised barnacles. Long Island mark, 1960-68. Above - salt-glazed pipes within a pipe. Green Island mark and mallards' feet. 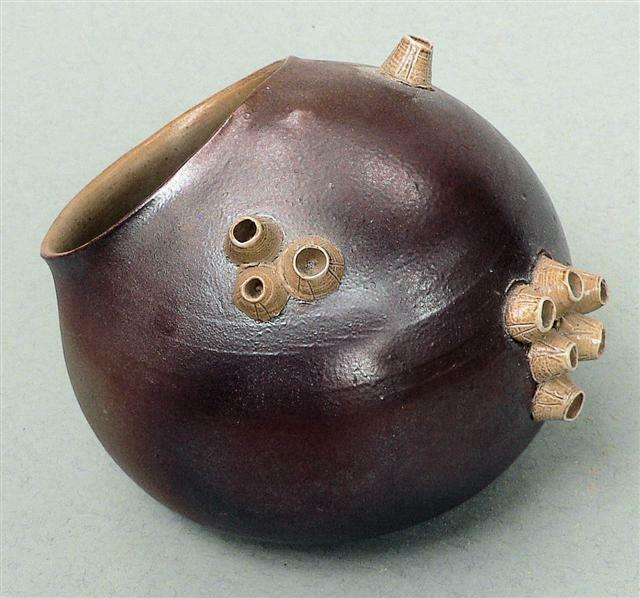 Salt-glazed pipe vases, Quay Pottery (1977 - 1987). The Quay Pottery was a partnership between Guy and his son Russell (who was by then in his early twenties) following Guy's resignation from Poole Pottery. 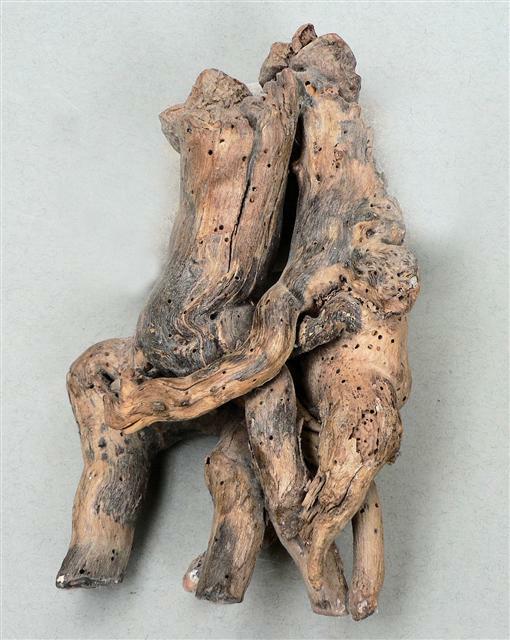 Above - driftwood from Guy's studio. Guy and Joan left Green Island in 1988 and bought a cottage near Wakeham on Portland. 'Rokko' describes the rough textured volcanic pots made by Guy in his Mermaid Studio from about 2000, inspired by the rockpools, wave-eroded stones and ledges of the Portland limestone. Above - Rokko 'crabby pot' textured with molten blue glass. Top left Portland rock frogs. Top right old salt glaze kiln. 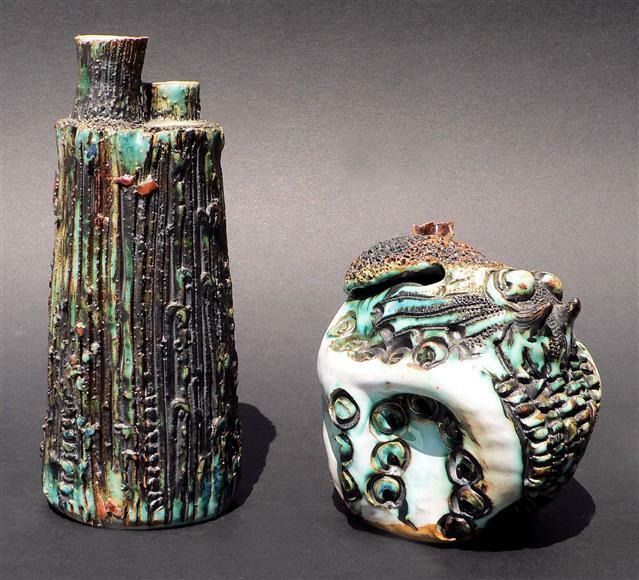 Bottom right left and below heavily carved and textured Rokko vases. 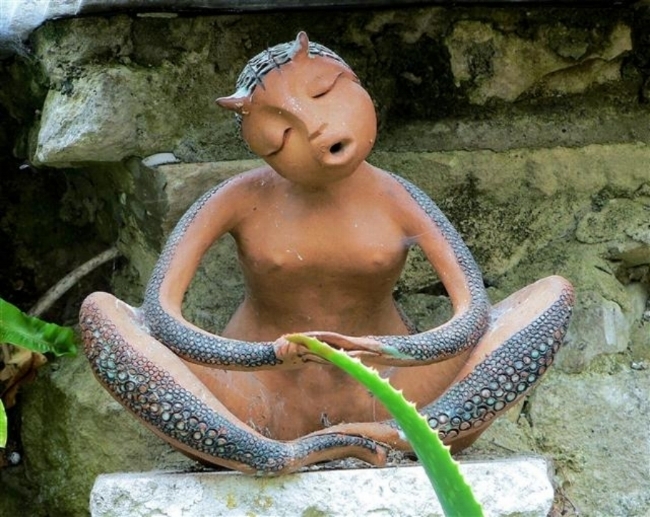 Above - Wakeham satyr in terracotta. 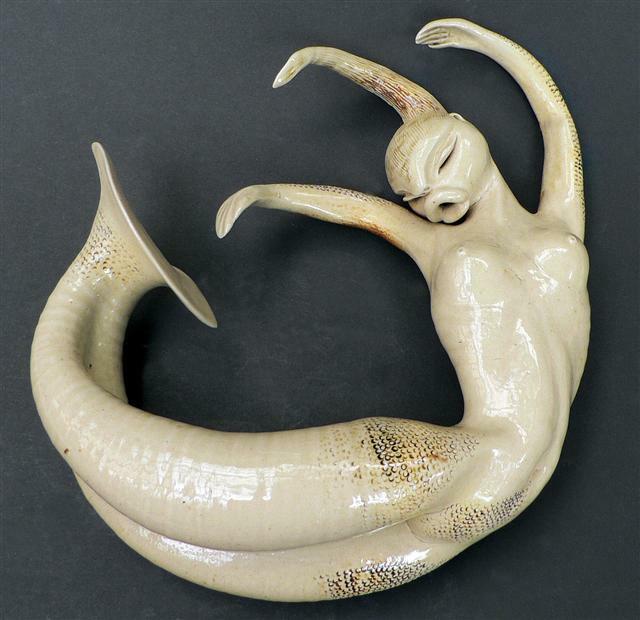 Above - salt glazed mermaid, Green Island. Above - Portland Sea Dancer. Above - terracotta sirens, Portland. Above - Green Island mermaids. Above - embryonic rock sculpture in two parts in the style of Henry Moore - Portland. Above left- Sea Princess. 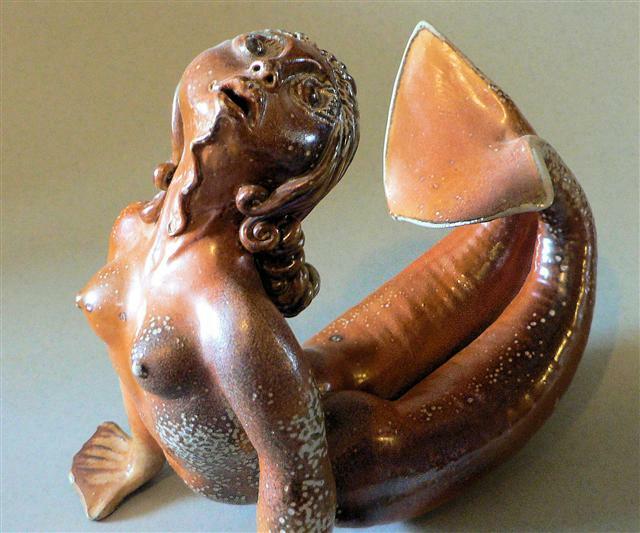 Right, mermaid verso, both Portland terracotta. 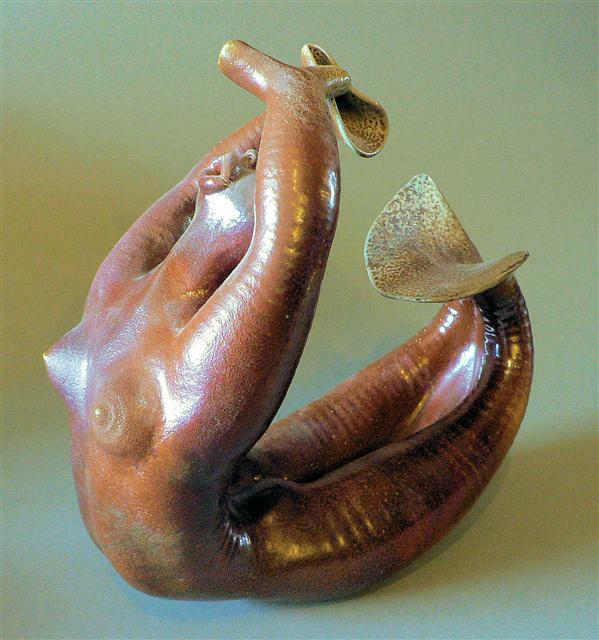 Above - 'flippered glamour-girl' in terracotta (Portland). Above - the spirits of drowned sailors. Yakshini wall plaques, the terracotta hand-pressed into a mould. Above - model bears by Joan Sydenham. 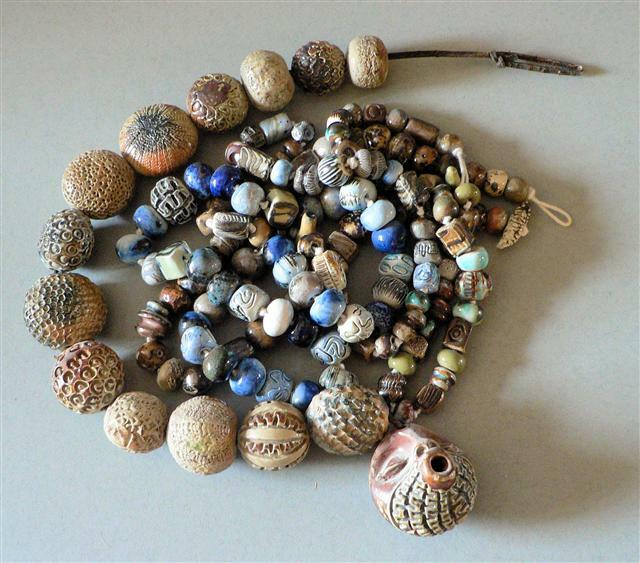 Carved and glazed beads, Joan Sydenham, 1960's. Joan Sydenham - ballet dancers and ice skater, 1999. This image was taken in the loft-room at the Wakeham Studio - for more images see below. Cups, mugs, saucers, bowls, teapots and coffee pots were popular with craft shops. While less spectacular than some of Guy's more adventurous pieces they were the mainstay of production. Above - beaker, Long Island early 1960's. Above - a selection of kitchen and utility ware, produced on Long Island and Green Island. Above - perfect vases in miniature. No clay was wasted. 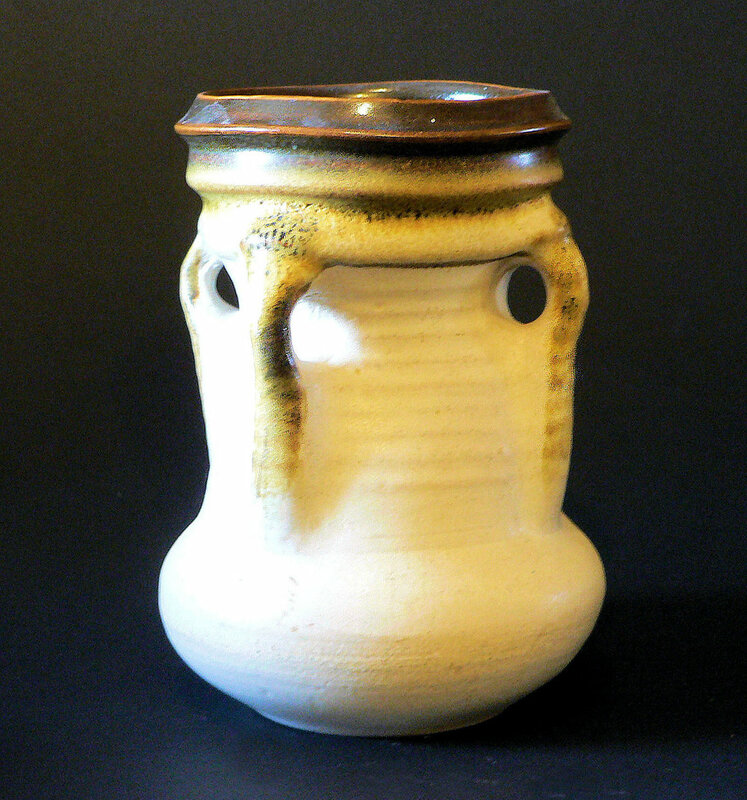 Salt-glazed coffee pot, Quay Pottery, 1977-87. Above - press moulded pendants. Above - salt-glazed 'mallard' tea pots. While out walking on the beach with Joan in the 1960's Guy saw a wing bone projecting from a the carcas of a duck. From that unlikely source of inspiration Guy went back to the studio and designed a handle for teapots. For a number of years Guy's loft room (converted for the purpose) served as a gallery, storage and sales area. The images below were taken in 2003.
" My brief after the War was to revive the old traditional majolica and Delft floral ware. 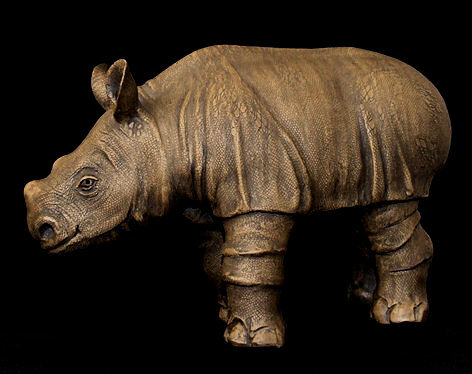 I had to train a new team of throwers and when this was up and running I managed to persuade the directors to let me have a studio separate from the factory and we began...to move into more creative and individual pieces of studio pottery. The 1950's and 1960's...was a very creative and fulfilling decade; then, unfortunately, commercial pressures to standardise and economise caused a dilution of standards and quality, when freshness and spontaneity became dulled by repetition - the result was inevitable. I left"
The adoption of the standard shapes of the Delphis Collection launched in 1963 did not preclude the production of one-off Studio ‘works of art’ and experimental pieces. Above - Poole Pottery publicity photograph adapted as a post-card. Sometimes called the QE2 vase, this piece takes its inspiration from the cruise ships of the 1950's and 1960's. In fact, it probably pre-dates the launching of the QE2 by several years. It was described by Guy Sydenham as ‘one of the best pieces I have ever made’. The vase is made of floor tile clay from Carter’s Tileworks at Hamworthy. The Plimsol Line is fashioned from white clay and the main body was given a wax resist so that the sprayed-on snow white glaze ‘crawled’ as the wax burned off, giving the effect of barnacles. The impressed ‘TV screen’ mark and manuscript 'GS' initials suggest that the vase was made between 1962 and 1964. Above - Atlantis era vase with applied fish scale decoration. Above - white clay vase (13.5 inches) modelled as a stylised seed-pod. 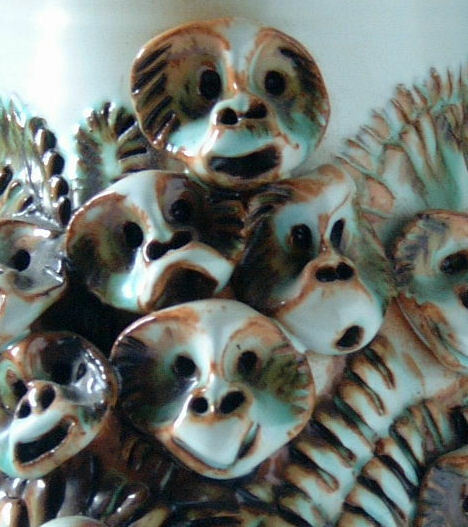 Guy made a number of vases with applied monkey faces. These were more refined descendants of the barnacle encrusted pipes which Guy first made on Long Island; the example above was made more or less at the same time. Guy's monkey vases were inspired by Kipling's poem 'Road-song of the Bandar-Log'. Above - 2 more monkey vases from the same era. 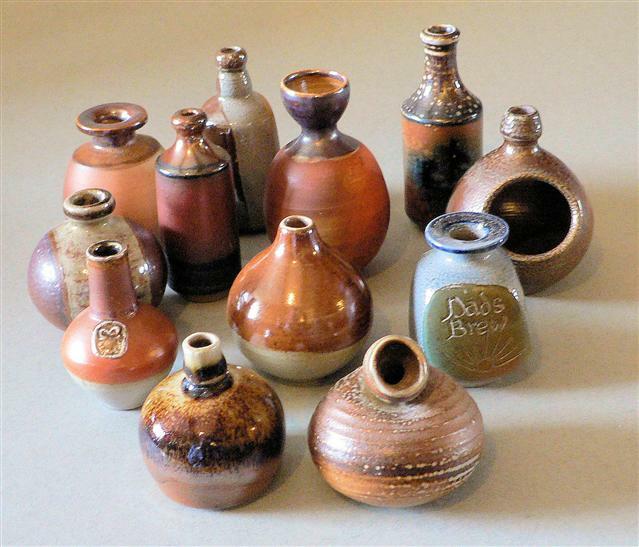 These examples were photographed prior to firing. Above - Tony Morris arrived at Poole from Wales in 1963. No one had any money. Tony was paid little more than a subsistence wage. However, staff were happy to help each other out. Tony's duffle coat was missing its buttons and Guy made these replacements. Like much of Guy's work they combine functionality (note the smaller lapel button) with art. The buttons have outlived the duffle coat. Above - a slightly later vase from the Atlantis era (early to mid-1970's). Guy gave each monkey its own face and personality. Above - retrospective, Portland 1999. Above - promotional leaflet for the Atlantis range, late 1960's. The vase on the bottom left is one of about a dozen vases made in the 1970's suggesting different nationalities. Guy referred to the vase shown above as his 'Green Chinaman'. The Green Chinaman on a bench with orange and white vases inspired by African head masks (and a caricature pot-elephant). The white vase (here photographed in the early 1970's) appears again below (photographed in 2011). 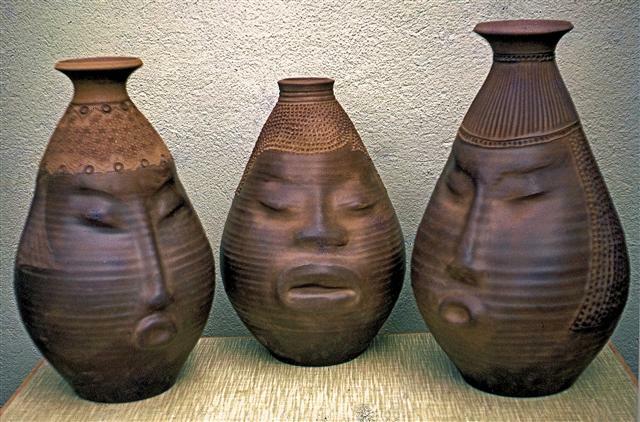 Above - three African head vases photographed before firing. The vase on the left is the same vase photographed outside the Studio (above). The two vases were united for this photograph but otherwise live separate lives. Photographed on the terrace outside the Studio c. 1972 (before firing). The left hand vase was probably glazed white. A very similar vase can just be made out in the background of a studio photo at page 129 of 'A Potter's Life'. 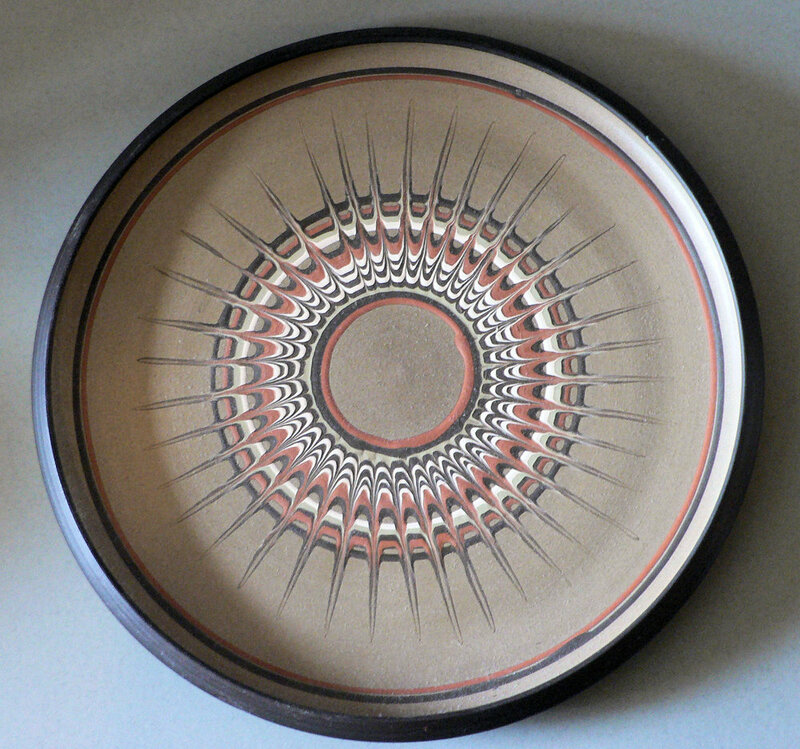 Throughout the late 1960's and early 1970's Guy produced some stunning individual pieces. The large vase above (and in the group top left below) was made to commemorate the opening of the Craft Section in 1966. The vase was thrown by Guy Sydenham and decorated by Tony Morris. It was sold by Christie's as part of the Museum and Archive sale in 2004. Guy liked a pun. Shape A12 of the standardised Atlantis range (1972-1977) was a helmet lamp with an internal bulb lighting the face of a knight. They were produced with a variety of stoneware and earthenware bodies with different carvings coloured slips and washes. Alongside the standard production there were some unique individual pieces. Above - Guy Sydenham - one-off self portrait knight light. Above - described by Guy Sydenham as his 'magnum opus' this is the last of about five lamps made by Guy from black clay to a similar design in the late 1960's and stands 32 inches tall. The lamp was given as a wedding present but may not have been quite to the taste of the recipients and remained in a loft until 2001 when it was consigned to Sothebys for auction, attracting considerable press publicity. Guy offered to purchase the lamp if it failed to reach its reserve and in anticipation of becoming its new owner drew some sketches for a complimentary lampshade in keeping with the original design concept (above). This included a port hole 'projector' on the reverse side to illuminate a Delphis or an Atlantis plaque on the wall behind.